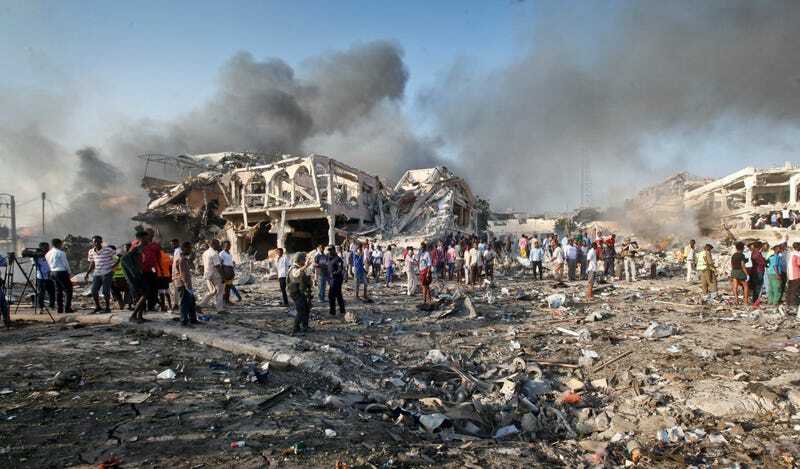 A devastating double-car bombing in Mogadishu, Somalia, has left at least 277 confirmed dead in what officials are calling one of the deadliest attacks in the country’s modern history. According to CNN, some 300 injured people remain hospitalized after Saturday’s dreadful attack. Some 40 of those wounded had such severe injuries that they were not able to be treated in Mogadishu and had to be airlifted to Turkey for treatment. Somalia’s Ministry of Information expects that the number of casualties may continue to rise as rescuers recover more bodies from the rubble. On Sunday the Office of the President announced that the nation would be in three days of mourning, with the national flag being lowered to half-staff to honor those who were killed in the attack. According to the BBC, al-Shabab, which is allied with al-Qaida and is known for attacking Mogadishu, normally claims responsibility for attacks shortly after they occur. The BBC notes that on Sunday, some Somalis took to the streets to call out the group for the act of terror. The explosion ripped through a busy junction, destroying hotels, government offices and restaurants. Of the dead, only 111 have been identified and buried by their families. Some 165 bodies cannot be identified and are expected to be buried in a national mass funeral.